All works are available in person at Made Solid until June 10th. Pieces will be available for worldwide purchase following that date. Visit the show until July 8th, 2018. Follow Made Solid on instagram for updates. We are proud to announce California My Way - a collaborative group show at Made Solid featuring a quartet of Japanese artists. 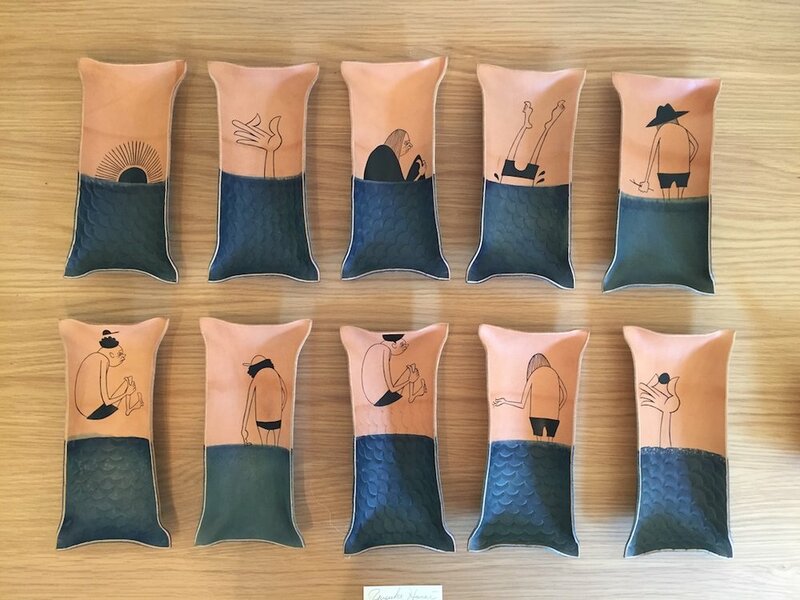 All have worked with Peter Maxwell of Made Solid in natural leather and indigo dyes to create new works in their respective styles, interpreting their versions of classic California. Yusuke Hanai was born in Japan in 1978. Yusuke left Japan for the United States in 2003 to study illustration at the Academy of Art College, San Francisco. Yusuke's artistic breakthrough occurred at the '06 Green Room Festival in Yokohama Japan when Laguna Beach based Wil Pennartz, owner/curator of The Surf Gallery was so impressed with Yusuke's sign painting that he invited him to participate in '07 The Happening in New York City. Expanding his illustration and fine art vision beyond his nostalgic roots, Yusuke continues to capture the hearts of many people worldwide. His artistic works have been exhibited in Australia, Brazil, California, Honolulu, London, New York, Paris, and Tokyo. Yusuke is currently living in Japan, where he continues his artistic endeavors as an illustrator/fine artist. This is our second collaboration with our friend Yusuke Hanai. We came together on a set of exclusive leather pieces and a pop-up event at Paddler's Coffee - Shibuya Tokyo, March 2017.
hi-dutch is an multimedia artist based in Japan, personal work in recent years include continued exhibition of surfboard repair skill combined with wood , yarn , resin to create a energetic visual expression. Also painting works using masking tape. Both are represented by lines. Koji Yamaguchi is a Japanese artist who pursues cityscapes mainly from the view of a skateboarder. Yamaguchi started to paint landscapes influenced by his grandfather, who himself was also a landscape painter. He has provided artworks to collaborate with numerous skateboard and apparel brands across the borders. From 2015, he moved from Tokyo and actively working based in New York. Shosuke Sean Suzuki is an artist, art director and videographer from San Francisco, Tokyo and Melbourne. Yusuke Hanai has been one of our favorites for years. Based in Japan he has been illustrating and designing worldwide, mostly in connection to music and surf culture. He's a good friend who fits perfectly with our California style. Taisuke Kijima runs Pacifica Collective from Tokyo. We became great friends through our mutual work with ACME Furniture. This project is our first together under new P.C. venture. 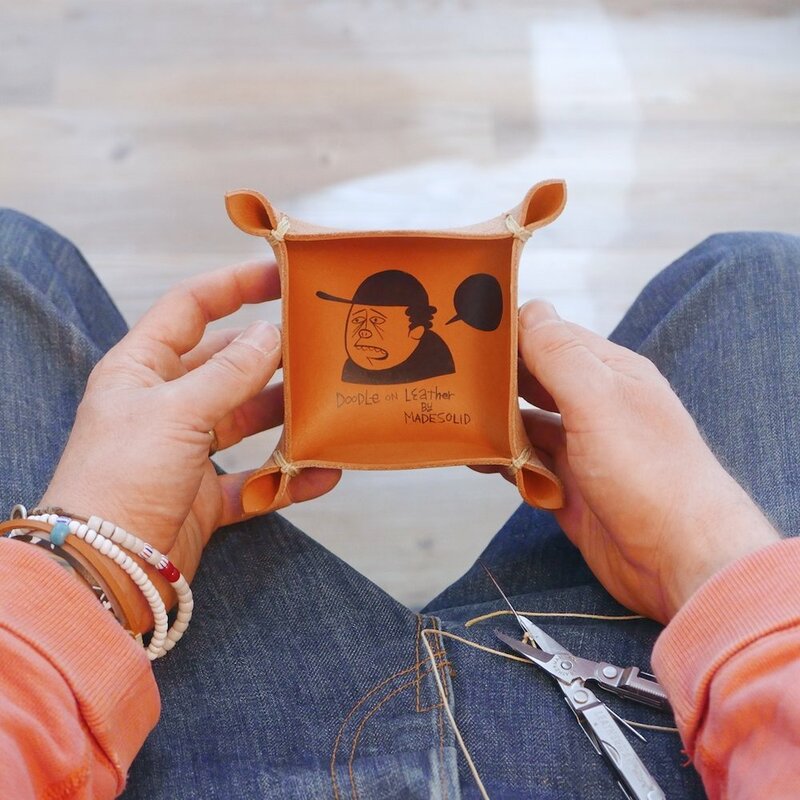 For the Pop-Up, we have dyed and stamped a limited edition of Hand Shaped Leather Trays. Yusuke is painting his signature imagery on each. We have also developed a limited run of classic Made Solid pieces featuring an exclusive indigo wash with wide white brush strokes. All will be available at Paddlers Coffee on 3/11 and 3/12. Pacifica Collectives will offer a few following the show. We may have a select few pieces available through our LA shop upon our return.